There's a very cool craft fair in McCarren Park this weekend called the Renegade Craft Fair, but we liked the way this sidewalk sale at Bedford Avenue and Metropolitan Avenue in Williamsburg fit together so nicely. The doorway in which it was located had been a graffiti magnet, then was cleaned up. We're glad to see that's it has again gained some flavor. 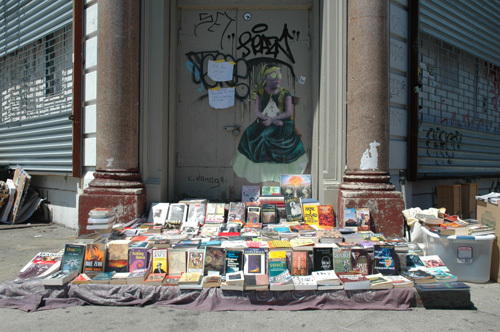 We call this, "Billburg Sidewalk Sale in Front of Closed Storefront Church."